Fishing is an old favorite hobby of so many. Being able to spend a day out on the water relaxing while coming home with the day’s fresh catch is the ultimate experience. Using your kayak to help you fish will mean that you get a great upper body workout while having a lazy day on the water. The best kayak fish finder is sure to impress your friends with some of the best catch of the season. Kayaks are an excellent way to get to the hard to reach fishing spots. Being manually powered kayaks won’t disrupt the wildlife underneath you. When out on the lake, guarantee you will come home with a fresh catch by using the best fish finder for kayak fishing on the market. Having eyes underwater is too sweet a deal to pass up. We love the idea and have done all the research so you don’t have to. Here are the top kayak fish finders on the market. This sleek looking orb is an excellent small fish finder for a reasonable price. Not only does it have a rechargeable battery, it has capabilities that allow it to connect to your smartphone. The 130-foot range is excellent for such a small and compact system. 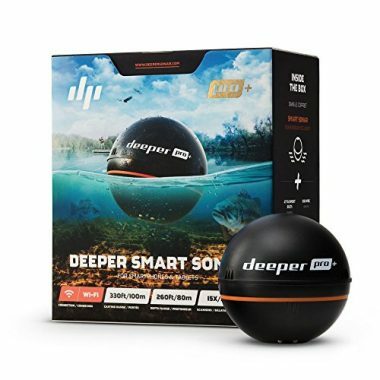 Coupled with the 15 and 55 degree angled cones, the Deeper Smart Sonar fish finder for kayak fishing will allow you to see the fish around you with ease. 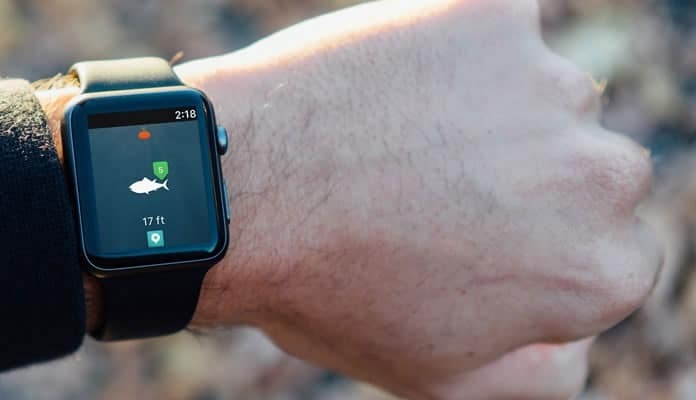 It even comes with an easy to use application that includes a calendar, weather, maps and even a sharing feature to show your friends your favorite spot. You don’t have to worry about the resolution of your screen as it utilizes your high quality smartphone’s screen. 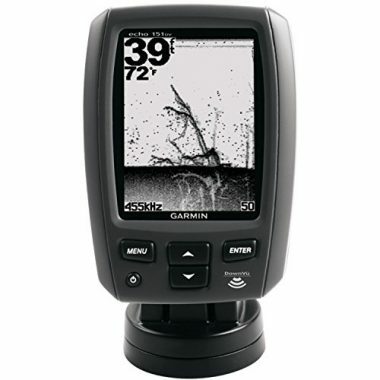 Garmin is a leader when it comes to kayak GPS fish finder devices. Their Striker 4 fish finder is one of the best money can buy. It has 3 sizes to choose from including a 3.5, 5, and 7 inch options. Every screen is colorful and easy to read making the fish stand out. You can plot your course and see your travel distance with a push of a button. It is also IPX7 water certified so your day doesn’t have to end when the weather takes a turn for the worse. This is the best portable fish finder that is a handy palm size gadget and will give yourself eyes in the water. 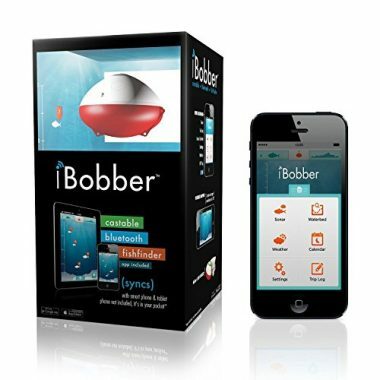 The iBobber allows you to mark fish, map the lake underwater, save water temperatures, weather and location, species, photos and hot spots. This allows you to know where the fishes are and even has a function to share it with your friends on social media. Compatible with any iPhone or Android using a free app. This device pairs using Bluetooth so you do not have to worry about messy wires. This is a great tool to have when ice fishing so you know you will cut your hole in the best location. With a 10+ hour rechargeable battery life, you can be sure that the iBobber will last your whole day of fishing. Never forget your day on the lake with the trip log function that will map your full fishing conditions. This palm sized portable fish finder kayak mounted device will help make sure you come home with the best catch of the season. 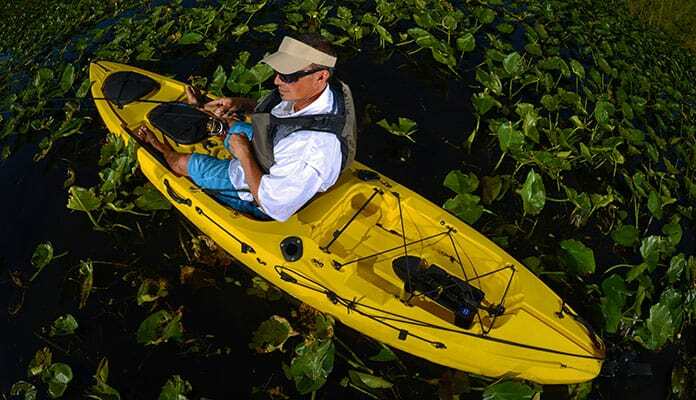 Garmin is at it again, this time with the fully waterproof Echo 151dv fishing kayak fish finder. The package includes a transducer which gives you an even more specific readout. The 8 level grayscale screen will give you as much information as you want even including the water temperature. The depth of the water is shown in large text in the corner of the screen so you can see it with a quick glance. This may look like a basic fish finder but it’s full of features that make it the best portable depth finder for your kayak on the market. It detects water depth, fish location and even weeds, rocks and sand. You can use this fish finder in lakes, rivers and even the sea to depths of 328 feet. There are 5 user selectable sensitivity settings to choose from including a battery save mode. It also has fish alarms to alert you when there’s fish under your kayak. Venterior knows the VT-FF001 Fish Finder is high quality and even offer a 2 year warranty with 24 hour customer service. 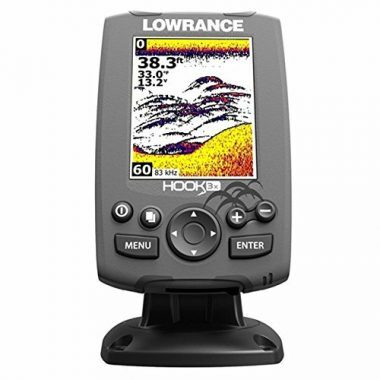 Lowrance is one of the best when it comes to ocean kayak fish finders. The Hook-3X has an LED backlit 3 inch color display that has a 320 x 420 resolution. This is excellent for details but also doesn’t use much power making it have excellent battery life. You will be able to see the contours of the bottom of the water. This will be a great way to determine where the fish like to congregate. Certain fish like deeper water while others like more shallow. The crazy part about this fish finder is that it’s able to be used in boats that go as fast as 75 mph. You’re not going to reach these speeds in your kayak, but it’s great to know it has that capability. This is a super portable handheld fish finder. It will fit in your hand making it great for even the smallest kayak. The screen is small, but very colorful and full of information. There are only a few buttons to use that navigate through the menus with ease. It can be used in waters up to 240 feet deep and give you a perfect reading of where the fish are. All of this runs off 4 AAA batteries which makes it incredibly easy to keep it running for entire days at a time. 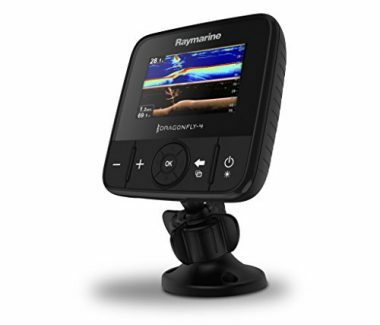 For those that fish solely in the USA, the Raymarine Dragonfly is one of the best fish finders on the market. With maps of US lakes, rivers and coastline you are sure to know where the fish are. Equipped with an SD card you can even save sonar screenshots to your phone. With an all weather, high definition LED screen you will be able to see the fish in real time color. The systems built in Wi-Fi allows you to save, rewind and share live sonar and the days catch straight to your phone to send them to your friends or share them on social media. A built in GPS connects to 50 channels you can count on accuracy and precision. The 4.3 inch waterproof screen is LED backlight so it will continue working even as the weather changes. This whole system runs off 12 volt batteries, making this exceptional system that much better. Expand your use with this device even being compatible as a fish finder for canoe trips. The Hummingbird fish finder is a full bodied machine. A 320 x 240 resolution screen will indicate where the fish are while showing the contours of the waters floor. Featuring a Fish ID+ which includes fish and depth alarms you will never miss your chance at a fish again. Sit back and relax while this fish finder does the work for you. All you need to do is throw a cast and watch. The incredible 320 foot depth range coupled with a 600 foot down imaging capability will ensure you can use this system in even the deepest water. This package will fit any sized boat with ease while giving you a large enough screen to see all of the fish with detail. You won’t have to worry about running aground any longer as it will sound an alarm at any depth you want. The IPX7 waterproof rating makes it easier to keep seeing the fish no matter what conditions you find yourself fishing in. 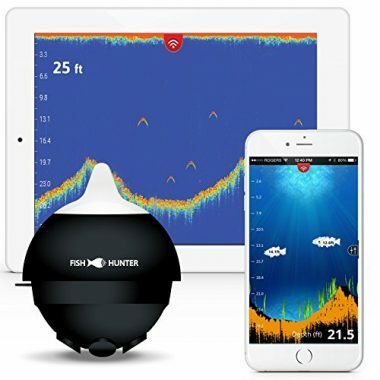 Using the screen of your smartphone or tablet the FishHunter fish finder will use 3D sonar and 5 transducers to show you exactly where the fish are. Not only will it show you the fish, but also how the bottom of the lake changes as you move around. Included in this high tech fishing tool is a map that tracks your location using GPS which also creates and saves maps of the floor of the body of water. The coolest feature is that this fish finder will tell you where to throw your cast to have the best chance of landing a fish. Built in WiFi allows you to connect to the device up to 150 feet away, perfect for trolling in fish filled areas. This kayak depth finder will ensure you never run a ground. All of this technology comes in a small and compact design that is lightweight and easy to use. Simply download the free application on your phone or tablet and you’re ready to go fishing. This setup is one of the best cheap fish finders for kayak available on the market. When looking to purchase your own fish finder for your kayak, we recommend knowing your options and keeping a few key factors in mind. This piece of technology is unlike other electronic gear you have ever purchased. Not only do you have to attach it to a small water craft but you also have to place it in a way where it has a good amount of protection from the elements. Fish finders are generally not fully submersible meaning you will have to put careful consideration as to how it can keep from getting wet. Paying close attention to the portability, depth of readability and waterproofing technologies will help to ensure that you have the best experience. What good is this technology if you can’t bring it with you everywhere you go? Some fish finders come quite large which aren’t as convenient for a small boat such as a kayak. Kayaks simply don’t offer as much space to fit a bulky fish finder. Opting for a smaller portable fish finder will allow you to bring it with you on all your trips. Portable systems are generally quite a bit lighter as well making them all the more desirable. When kayaking, every bit of weight matters and so having a lighter system will making it so that you can paddle faster, easier. The beauty of kayak fishing is that you gain access to a whole new realm of fishing you couldn’t get to when casting your line from the shore. No longer are you limited to the access points from the shore but you have the whole realm of dropping your line into the middle of a lake. With these new depths in mind, you will want to be able to have a visual view of all that is going on underneath you with a fish finder. Being able to fully explore the depths around you is only possible when you have a fish finder that allows for this. Be sure to pay close attention to what depth your fish finder is rated for before making your purchase. If you plan on fishing in water that is over your rating of fish finder you will be missing out on potential area fish congregate. While this may be an obvious factor, you should always remember that even the most experienced kayakers will more than likely have some water aboard. This is a watersport for a reason and you should expect to get wet. Whether you get swept away by a river current, splash some water or get stuck in the middle of some unfavorable weather, it is important that your fish finder can come along with you. Opting for a waterproof fish finder will ensure that you can take on the lake no matter the conditions. While it might cost a bit more money, it will surely save you in the long run. You can always add it your xmas list as it’s one of the best gifts for kayakers. Once you have bought the right fish finder for your kayak, you will have to install it onto your kayak. This is not always the easiest task for many reasons. The first being that you will want to keep your fish finder within an easy reach while you are in the water but also ensure that it does not inhibit your paddling. Additionally, you will likely be bringing a lot of gear on your kayak with you so finding the best spot for your fish finder may pose a challenge. Once you have all of your tools, you will need to gather some materials as well. You will want to start by drilling a hole using your ⅛ inch bit. From here, fit your Gear Trac over this hole and secure with a screw. All of your holes will be drilled smaller than the screws and bolts meaning you will have to thread the screws in. This will work to create a watertight seal. Drill a second hold on the opposite corner and, again, secure with a screw. On the two remaining holes use your 5/32 inch bit to drill the remaining holes and screw in your bolts. Reaching through to your front hatch, slide on your washers and then add the nuts. Use your socket wrench to tighten these to secure. To install this you will have to remove the seat of your kayak and flip your boat upside down. Remove your transducer plate and thread the transducer wire through the scupper. Secure your transducer to the brack that comes in your kit. You will want to be sure not to tighten this too much and instead leave some space between your transducer and your bracket. This will help to ensure it functions correctly. Finally, screw the plate into the hull. Flip your kayak back so that it is leaning on its left side with the right side of your kayak facing up. Open the front hatch and remove any foam flotation blocks. Reaching through the hatch you want to remove the through hull fitting by twisting the nut off and pushing the fitting out of the hole. Grab your rubber O ring and place it over the hole. Thread your transducer cable down through the O rin2g and hole. Pulling your cable through your hatch until it is tight pop the rubber gasket out of the through-hull fitting and place it onto the cable. If the gasket doesn’t fit securely select one that does. This is where you’ll need the gasket that comes in the box. Make sure it fits on the hole that you made without any space around it. You can use a screwdriver or butter knife to help seat it correctly in place. You will need to drill two holes for the transducer cable and power cable. They should each be around a ⅞ to 1 inch hole. This will allow you to run your cables without pinching them. After drilling the holes be sure to dull and clean the edges. They will be sharp and can cut into your wires. You can do this by using a razor blade or exacto knife. The system will include gaskets and nuts so that it creates a watertight seal around your wires. Be sure to follow the instructions as each system will be slightly different. Next, you will run the wires through the hull and add the cap when you’re done. Pro Tip: Never cut any wires. Once they are cut the entire system will not work at all. This step involves stripping the ends of the wires and connecting them to your battery. The positive end will be red while the negative end will be black. You may need to strip some of the sheathing at the end of the wire. This will give you some extra room to play with when connecting the wires. You will want to wrap the wires around a few times to ensure the best connection possible. Soldering and shrink wrapping the wires is not required for most systems but will ensure you have battery even in rough conditions. There are kits that you can buy that will have everything included for this process. You can borrow a hair dryer which will also give you the heat you need to shrink wrap the wires. As you are in a wet kayak, be sure to secure your wiring that leads to your fuse into the grooves in the rear of the screw mount. This way when you tighten your bracket the fuse will be up off the bottom of the hull. Not only will this protect it from getting wet but also from corroding over time. If you are installing a permanent fish finder to your kayak this is an important step. It will restrict your battery from moving around and ensure you always know where it is. If something were to happen where you were to roll, the battery would stay in the same position. It will also ensure that the wires from the battery to the fish finder stay attached so you don’t lose connection when you need it the most. This will give you a better connection between your wires and the battery. It will also create a seal that keeps water from affecting the fish finder or the battery. Utilize the zip ties to bundle any loose wires together. You can then secure them out of the way by wrapping them around your mast post. This is the best step. You get to see all your hard work payoff! There are many things that make a good kayak fish finder. Everything from the size of the screen to the frequency the transducer works off will affect your day on the water. 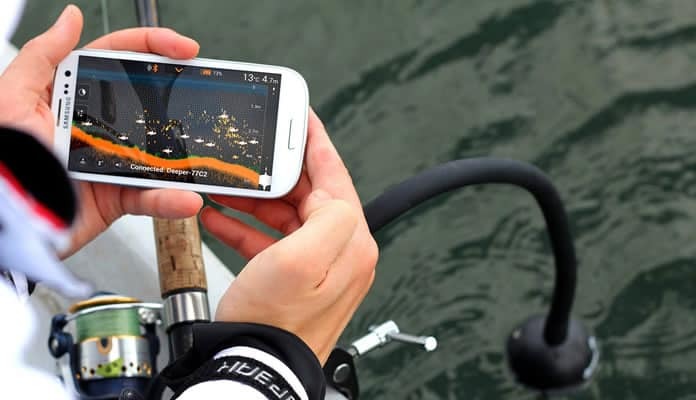 Since a kayak isn’t a huge fishing boat a large screen on your fish finder may actually be a hindrance. Fish finder screens range in size from 3 inches to upwards of 6. Being able to see the screen and the fish is easy on a screen 4 inches or larger. Some even use the high resolution screen of your smartphone or tablet to show you exactly where the fish are. This is the part of the system that sends the waves to find the fish. Depending on the system a transducer can either be attached to the kayak or dangle freely in the water. It is important to angle the cone, the part that reads the waves, in the direction you wish to fish. A wide angled cone will give you the best visual on the water below you and the fish it holds. These angles can range from 9 to 60 degrees. A rating of 20 degrees is a good starting point for people who like to fish in different water depths. Just keep in mind that the deeper the water the less sensitive the reading will be on your fish finder. Each machine will work on different frequencies. Different frequencies allow you to fish in deeper or shallower water. For example, a shallow water fish finder will range in the 192 and 200 kHz frequency while deep water will use lower frequencies like 50 to 200. Since you are using your kayak to fish you won’t have lots of storage space for a battery. There is a balance between performance and readability. A high resolution screen requires a high amount of power while a lower powered device will show readings slower and in less detail. Many fish finders have built in batteries that last upwards of 10 hours, while some run off large 12 volt car batteries. The screen of your fish finder will be one of the most important parts. If you cannot see the fish clearly the whole system is useless. Resolution is measured in pixels much like that of a regular television. We recommend not getting a screen with a lower resolution than 240 x 160 as the detail won’t be high enough to distinguish clearly. A high resolution screen will start around 640 x 640 and increase from there. Just keep in mind a higher resolution screen will use more energy which can reduce the fish finder usability. Instead of a grainy set of dots on a screen 3D sonar shows a detailed view of the area under you. It will allow you to see the slope of the floor and even the plant life in great detail. This is an excellent feature as you will have the best idea of where the fish are and how many are populating the body of water you are in. Make sure when purchasing your kayak fish finder that it comes with a way to mount it to your rig. It can be cumbersome and make your day feel long if you have to keep one hand on your fish finder while you throw casts. Look for angled arms or stand that can easily connect to the edge of your rig. You will be able to wrap and necessary cords around the arm to make sure they don’t dangle in the water. Depending on your use a GPS may be a nice gesture to have. If you travel to new lakes and fishing holes a GPS will allow you peace of mind of not getting lost. If you regularly stick to a few places you are familiar with a fish finder without a GPS can save you some money. A fish finder uses sonar waves to determine where the fish are. It works in the same way as large ships use to find their location in relation to the shore. Essentially the unit will send out a signal from the transducer and then determine where objects are based on how long the signal takes to get back to the starting point. This will show you how far the fish is away with a reading on the screen of the fish finder. But this also works for the bottom of the water. You’ll be able to see how the land under your kayak changes depths. This is key information that you can use to find the fishes hiding spots as some types of fish like different depths of water. Where Are You Fishing: Shallow Or Deep Water? You will need to determine what depths of water you’ll be mainly fishing in. The depth of water the fish finder will be compatible with should be based on this information. Fish finders that use a dual frequency set will be able to be used in deeper conditions. For example, one that uses 77 and 200 khz will use the 77 rating for shallow waters while the 200 khz will extend the range. When you’re looking at this spec keep in mind that the lower number will be for the shallow water while the higher number will allow the fish finder to see fish at a deeper water depth. There are many different types of signals fish finders use. This can range from the new Compressed High-Intensity Radar Pulse (CHIRP) technology to the older sonar waves. Obviously, the newest technology will yield the most accurate readings. 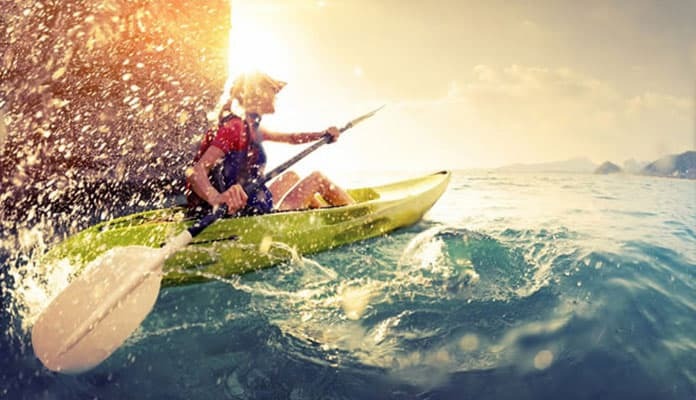 You should know that the depth will vary depending on the type of water you kayak in. Salt water will make the signal harder to travel through the water which, in turn, reduces the distance it can “see”. Keep this in mind if you plan to deep sea kayak fish. Down Imaging And Side Imaging: What’s The Difference? Fish finders use transducers that have different capabilities. This refers to the angle at which the transducer can see. While some can only read what’s directly under your boat – called down imaging – others can have a wider field of view. We like the ones that show as much area as possible. This gives us the most information possible that we can then use to land a big fish. When looking for this feature we suggest looking at fish finders that have a higher degree (like 50) if you are fishing in more shallow water. But if you regularly fishseat of your kayak in deep water you may want one that has a lower angle (around 10-15 degrees) as it will increase its depth capabilities. Technology has a way of making the world much more efficient and that is exactly what a kayak fish finder does. Used when fishing these devices work to scan the water and tell you where the fish are. This will help you to find the best spot to cast your line. Lots of fish finders will track your route and allow you to star locations that had lots of fish. Most fish finders on today’s market work with your smartphone to download all the information seamlessly. Every serious fisherman will want to have a fish finder attached to their kayak to help them scan the waters. This will allow you the best opportunity to track where the fish are and how they travel. This works to take the luck out of your next fishing expedition. The problem with technology a lot of the time is that it can be so complex that users struggle to use it to its full potential. When out on the lake with your fish finder you will likely experience quite a bit of glare and the last thing you will want to do is struggle with your fish finder. For that reason, it is important to get familiar with your device before you head out on the water. Many fish finders are designed to be quite user friendly featuring only a few buttons and simplistic functions. It is also important to pay attention to how big the font is on your device. It is best to opt for one with a larger font so you will not need to do any additional work to get a reading on your unit. In the past, fish finders were primarily black and white in color. The reality of this turned into a screen with a million shades of gray. While this still provided a view of the underwater world, they were often quite hard to read. In today’s world, most electronics now come with colored screens. These are preferable in every way. Colored screens show much more detail allowing you to get a better picture of what is going on in the water underneath you. Colored screens now dominate the market as they work much better, especially in outdoor use. When in darker overcast conditions or with intense glare, colored screens are far easier to read than the previous black and white design. Cone angles essentially refer to the angle the kayak fish finder can show. Think of this area as a triangle that starts at the transducer under your kayak. The width of the triangle is the number of degrees of the cone. The deeper the signal goes the wider the area it encompasses. A larger cone angle will show you a bigger area than those with smaller numbers. Just keep in mind that the reading gets more limited as it travels through the water. This means that even though a fish finder has a 1600 foot depth reading it may not be as accurate as one that has a 400 foot depth capability. You will find that typical cone angles range from around 10 to 65 degrees. But the majority of fish finders will stick to around the 15-20 degree range. If you are looking for a great all around cone angle we suggest you search for one in the 20 degree area. It works great for many depths of water. Transducers are useful in that they offer multiple cone transmitting from a single starting point. This will move from a single beam design of standard transducers to a dual beam, triple beam, side beam and more from a more advanced transducer. The more beams you have the more area you will cover in the water. This is ideal for maximizing efficiency, especially when traveling in larger bodies of water. It is important to check whether your unit comes standard with this accessory as some will require an additional upgrade. Oftentimes more expensive models will naturally come with these features while you will have to pay extra for cheaper models. While size and design are important features, ultimately a quality kayak fish finder comes down to the software inside your device. Most modern units come with GPS technology which is important in finding the best spots and having the most luck in the water. This GPS technology works to track the fish as well as help you get back to this spot on future trips. There are a few units on the market that lack this technology but most include it as it is quite crucial. 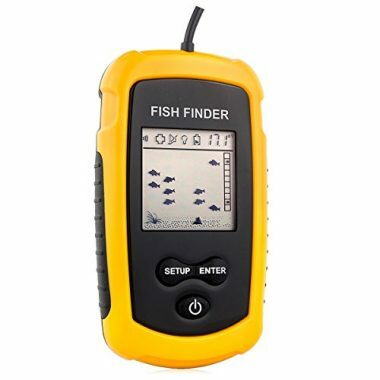 You will find differences in the style and display of each fish finder. Every manufacturer will have their own flare. To trim this learning curve we recommend sticking with a manufacturer you are already familiar with. Whenever you are looking for any new technology, it is important to consider your budget. Typically these devices cost between $50 – $300 depending on technology and manufacturer. It is important to decide on a price that you are most comfortable with before starting your search. Paying attention to specific functions such as GPS and smartphone compatibility will play a big role in the price. There are many ways to accessorize your fishing rig but having a quality fishing pole & fish finder is one of the best ways to ensure you get the most out of your fishing trip. Q: What To Look For In A Kayak Fish Finder? A: There are many aspects you should consider before purchasing a fish finder. These can range from portability to screen size to how they are powered. One of the most important aspects or things to pay attention to is the display screen. After all, your fish finder will only be useful if you can actually read what it is telling you. Having a high resolution screen will be perfect for displaying all your information regardless of the harsh sun beaming down on you in the water. You will also want one that is weatherproof so you can trust that the fish finder will work no matter the outdoor conditions. From there, pay attention to battery type: it should be 12v compatible, must be easy to update, reasonably easy to install, and ideally have as few buttons as possible. Q: What is an ideal screen size for a kayak fish finder? A: Your fish finder will be useless if the screen is too small for you to use it. Screens can range from an inch to upwards of 8 or 10. There are a few things you should keep in mind when considering the screen size of your fish finder. How far away you’ll be sitting. If you are sitting with the fish finder close to your body you may only need a small screen. But if you are planning on having the fish finder set up near your feet you may need a larger option. Screen resolution is just as important as the size of the screen. 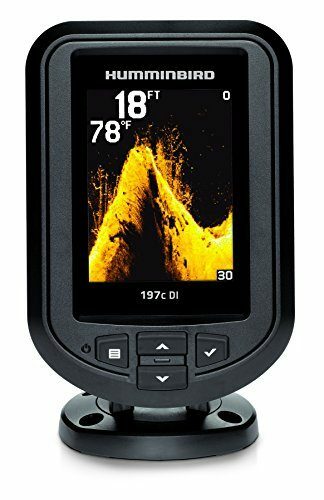 You could have a screen that is 8 inches big, but if the fish finder has a low screen resolution you won’t be able to make out the fish with any certainty. Screens are measured by the amount of dots they contain. For example, a screen that has a 300 x 200 resolution will have 300 dots along the horizontal and 200 dots on the vertical. We suggest a screen that has a resolution of at least 320 x 240. This will allow you to see the outline of fish in the brightest sun. Obviously, a higher resolution screen will give you the most accurate description of not only where the fish are but also their size. A larger size will also add extra weight and require a stronger support system. If you are paddling on a sit on top kayak you may have trouble keeping a larger model upright. Smaller screens will only require a stand that has to support a few ounces instead of upwards of a couple pounds. With all that being said, we find that the sweet spot is around 4 or 5 inches big. This creates a nice compromise between actually being able to see the screen while still being portable. This size also lets you bring it on a fishing paddle board or any type of kayak or even an aluminum boat. 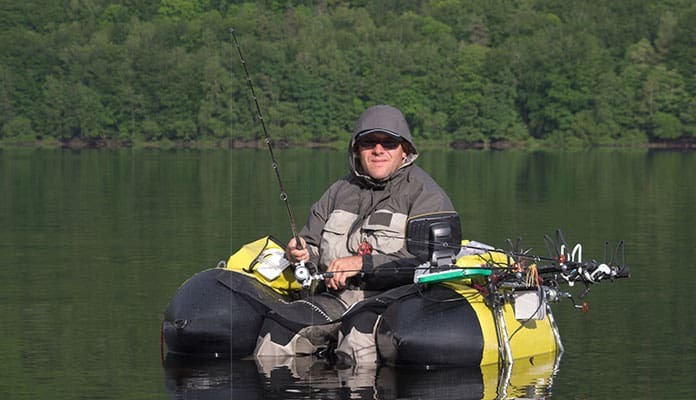 Q: How will my fish finder get power when used on a kayak? A: No matter what kind of fish finder you get it will require some form of battery. Just like your cell phone, a fish finder needs some way of powering the screen and sensors. There are a couple ways this can be done. The first is a rechargeable battery. These are batteries that you can plug into your fish finder that will power it. The great thing about this type of power is that you can buy a couple sets so you can stay on the water for an entire weekend. When they run out of juice, simply plug them into an outlet and you’re good to go. If you only have one you can even find an inverter that you can plug into your car’s cigarette lighter to charge them up (do this while your car is running as it can drain your battery). If this doesn’t sound appealing to you there is the 6 Volt option. This involves purchasing a battery and making or buying a housing for the fish finder. This option is one of the more popular ones as these batteries last much longer than small rechargeable options. Just keep in mind you will want to get a deep cycle battery. This allows you to recharge the fish finder after you’re done at your lake. Q: Where is the best place to mount my fish finder when I take it out on a kayak? 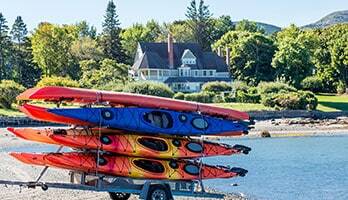 A: No matter what style of kayak you have it won’t have loads of room for gear. Obviously, you will want your kayak fish finder to be somewhere you can see it. You should also keep in mind that you’ll be using this for the better part of your day. It will save your body if you have the fish finder in a boatplace that you don’t have to turn your head to look at it. After all, this is supposed to be relaxing, right? With that being said, we like to have the screen part within arms reach, preferably off to one side. This will allow you to swivel the arm so it’s across your lap. When you don’t need it in front of you, or you’re reeling in a big one, you can simply move it aside so you’re not permanently tied down by it. The transducer (the part that sends the signal which indicates where the fish are) can be attached to the bottom of your kayak. We like to put ours between our feet and seat on the inside part of the hull. This allows the unit to send its signal without being bumped or moved around. 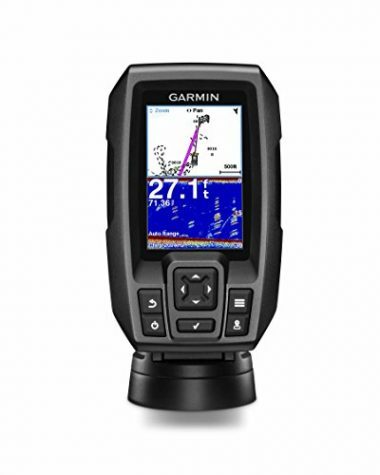 Q: Should I get a GPS with my kayak fish finder? A: More and more fish finding units come with GPS included. We like having this feature. Being able to look back through your history and know exactly where you caught the big fish on a certain lake makes us happy. It also creates a nice log of lakes that have stock in them. Instead of you having to remember, or plot it on a paper map, you can simply turn on your unit and be reminded of where you had the most success. A GPS unit can also help if you’re on a big lake. If you want to go where the fish are but still remember where your campsite is, a GPS will take the guesswork out of your time on the water. This is also a nice feature if you’re doing some fishing around dusk. The worst feeling is knowing it’s getting dark and not being able to remember where you are. For all of these reasons, we suggest spending the extra money to get one with a GPS unit included. It will make your weekend, or even afternoon, trip to the lake easier and more relaxing. Not having to worry about getting lost, and knowing where you caught your fish will decrease your stress while increasing your happiness. Q: How do I choose the best kayak fish finder? A: Determining the best fish finder for your kayak will depend first and foremost on your type of usage. If you are planning to do the occasional small lake fishing, you will need a different fish finder than an avid fisher hitting larger bodies of water. The budget you have for your fish finder will also help to narrow down your options. 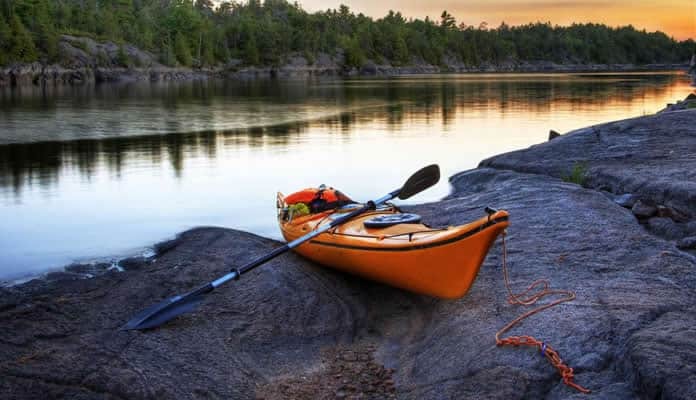 Depending on all the other gear you have, and even your type of kayak will help to narrow down your search. Fish finder kayak reviews agree that having a small ultraportable device that maps the underwater area makes for the best fish finder for your kayak on the market. With some stretching to depths of an impressive 160 feet, you now have eyes under the water. 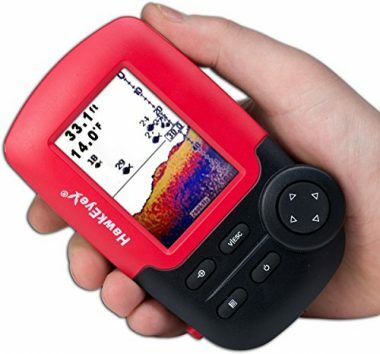 On your next day on the water, coming equipped with the best fish finder will help you to bring the nicest catch home impressing your friends and your wife. Love to fish? Have you ever tried using a kayak fish finder on our list? Let us know how you like it in the comment section below.